HIV infects a person's body by making copies of itself inside the person's bloodstream. PrEP medication attaches to the virus and stops it from being able to make those copies. If you are taking PrEP and are exposed to HIV, it is less likely that the virus will be able to multiply in your cells, so there is a lower chance that you will become infected. If you are taking PrEP, you need to take one pill, once-a-day, every day. It is very important that you remember to take your pill every day. You can take the pill at whatever time is good for you, and you can take it with or without food. Right now, the only medication that has been approved for PrEP is called Truvada. 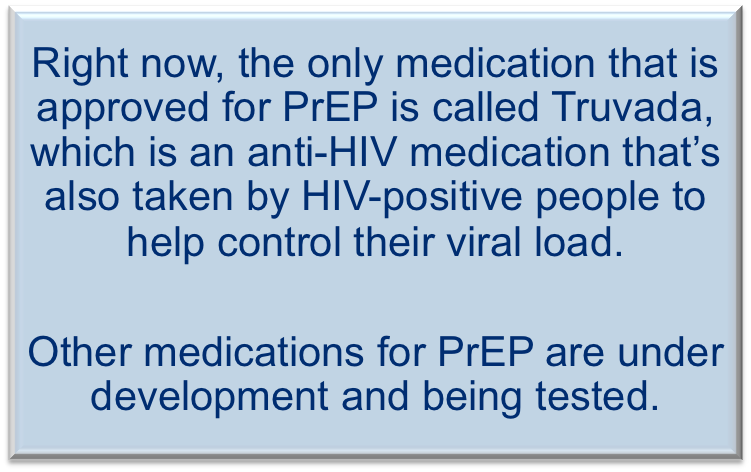 Truvada includes 300 mg of tenofovir (TDF) and 200 mg of emtricitabine (FTC). Truvada should be stored at room temperature (not in the fridge, over the stove, or in a hot car). Many people on PrEP don't report any side effects, but the most common side effects are nausea, gas, bloating, stomach cramps, and headaches. These symptoms often get better or go away completely within the first two months of taking PrEP. There are some over-the-counter and home remedies that can help with these symptoms. There are other side effects of the medication that are rare but are sometimes serious. The medication used in PrEP can cause damage to the kidneys, so your provider will check your kidney function at every visit and will stop PrEP if necessary. The medication has also been found to lower bone density (i.e., bone thickness), which can make someone more vulnerable to fractures. Will taking PrEP make me resistant to HIV medications? So far, people in PrEP studies who became HIV-infected after they started the study did not show resistance to HIV medications. However, drug resistance can occur in people who start taking PrEP when they are already HIV-infected (and don't know it). This is why HIV testing and medical evaluation before starting PrEP is so important. It's also why it is so important to continue to get regular HIV testing while you are taking PrEP (every 3 months). If you stop taking PrEP for any reason, make sure you come in and get an HIV test to make sure you are still HIV-negative before you start taking it again! How do we know that PrEP works? There have been several large-scale scientific studies (called randomized controlled trials, or RCTs) that have shown PrEP to be effective in reducing the risk of HIV transmission. All of the studies show that adherence to the medication is very important...PrEP won't work if people don't take their pills regularly. If you want to know more about the specific studies that have been done to explore PrEP's effectiveness, click on our Science page. Does PrEP protect against other sexually transmitted infections (STIs)? No. PrEP reduces your risk of HIV infection, but it does not protect you from other STIs like syphilis, gonorrhea, or chlamydia. It is recommended that you combine PrEP with other risk reduction practices to keep yourself healthy. If you are taking PrEP, you should get tested regularly for other STIs. PEP is a 28-day regimen of anti-HIV medication that a person takes after a high-risk exposure to HIV. People who take PEP must start the medication within the first 72 hours after their exposure in order for it to work. PrEP means taking an anti-HIV medication every day. That way, if you are exposed to HIV, you are already protected. What does FDA approval of Truvada for PrEP really mean? The FDA's decision means that providers can now prescribe Truvada for PrEP to HIV-negative patients. The FDA approval was based on medical evidence about the drug's safety and effectiveness in protecting HIV-negative people from becoming infected with HIV. It also means that some insurance companies will now cover PrEP medication for HIV-negative patients, and some states can put PrEP on their formulary for Medicaid. How much does Truvada for PrEP cost? If you are a participant in the SPARK project and you decide to take PrEP, we will provide once-daily Truvada to you for 12-months at no cost. If you decide that you still want to take Truvada after your 12-month participation in the study, we will work with you to make a transition plan to insure that you can keep taking it. Many private insurers are now starting to cover Truvada for PrEP, and New York State Medicaid covers the medication as well. For people who don't have access to one of those two options, Gilead (the pharmaceutical company that produces Truvada) has a Medication Assistance Program that can provide the medication free of charge to eligible patients. PrEP isn't for everyone. Some people already have a strategy for staying HIV-negative that works for them, which may include consistent condom use, a monogamous partner, regular HIV and STI testing, etc. PrEP is for people who haven't been satisfied with their sexual health strategy, or who feel like they need a better option to keep themselves safe and improve their sexual health. If you are a SPARK participant, you can get PrEP for free through the study. If you are not a SPARK participant, talk to your doctor about whether he/she can prescribe PrEP for you. If you decide you want to stop taking PrEP and you are part of the SPARK study, please give us a call and let us know at 212.271.7242. It's fine to stop PrEP, just make sure you have another plan for taking care of your sexual health! However, stopping and then starting PrEP again is dangerous - if you become infected without knowing and start taking PrEP again, your body could become resistant to the medication. If you stop taking PrEP and want to start again, make sure you get an HIV test to make sure you are HIV-negative! Can I drink while I'm taking PrEP? You can drink alcohol while on PrEP. There is no evidence of interactions between PrEP medication and recreational drugs. Use your judgment to keep yourself safe and healthy. If you are worried that your alcohol or drug use might be causing problems for you, talk to a health care provider.